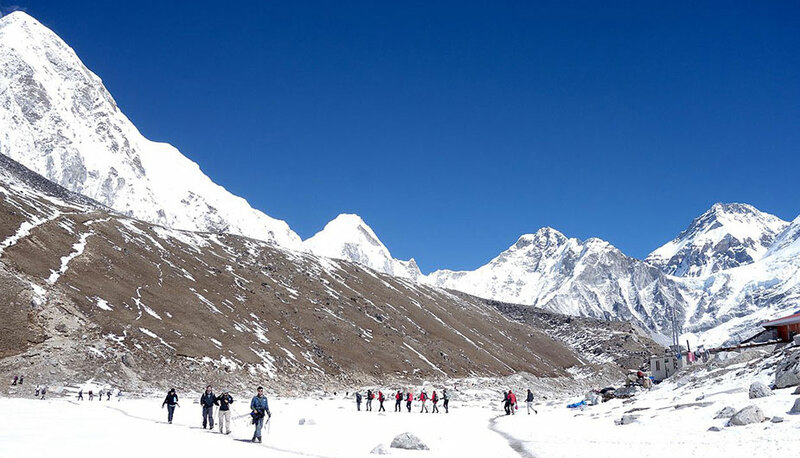 To complete the Everest Base Camp trek, you have to go through a journey of 130 kilometers. Although you might say, “I can walk 130 kilometers with ease.“, there are many things you have to take into consideration before you can take this trek lightly. The altitude of Everest Base Camp trek is up to 5500 meters. For many people, this is troublesome as not all people live in altitude this high. Also, you have to take into consideration that you will be walking uphill. And running on flat roads and treadmills don’t give you the appropriate preparation for starting an Everest trek. Besides, you have to carry a backpack. And, not to forget the sheer number of days that you have to trek – around 14 days. For inexperienced people, this takes a toll on your body. There are plenty of people who come to trek to Everest and think that they will complete the trek with ease. Ones who are not well trained gets severely exhausted. They can neither cope with the physical stress nor the mental strength it requires to get to the Base Camp. So, for all the enthusiastic travelers who want to go to Everest but don’t have any idea about how to prepare, I have come up with a comprehensive guide to the training program. These 5 easy steps will help you prepare for the trip to Everest Base Camp. If you’ve never hiked before and want to go to Everest Base Camp, you need to practice hiking. Make sure that you complete 4 to 5 hiking packages before you start Everest Base Camp trek. If you don’t have any places to hike near the places you live, you can book an early trip to Nepal. There are very good hiking trails in the hills that surround Kathmandu valley. Chisapani trek and Nagarkot trek are available for anyone who is looking for a cheap hike. These places have an elevation of more than 2000 meters. Hiking experience here will definitely come in handy. If you don’t have time for preparing hiking in these places, you can try walking/jogging long distances. A jog for about an hour or two or hiking/ walking in places that are flat can be good preparation too. The biggest thing to consider is that you are constantly strengthening your leg muscles so that they’ll be able to endure long-distance walking. You might worry when you listen to the word ‘ Cardio ‘. But you should not. Cardio is simply an exercise that generally requires you to generate a lot of energy. Swimming, running, and cycling are some examples. You might fear that you’ve not taken these exercise routines seriously before. But the best part is that it is not compulsory. As with all things you are good at, this will come with time as well. First, you need to buy a good pair of shoes so that you have fun while running or cycling. And you should start with short distances. If you have never considered running as an exercise, you can start by a 5-minute run. Go slow. As you get the hang of it, increase the length of time you run for. You can gradually work with your pace as well. A fitness instructor will come in handy. If you don’t want to spend money on personal trainers, you can listen to experiences from your friends or YouTube professionals. Once you are a decent runner/ swimmer/ cyclist and have an experience of (one of) these exercise for 4 – 6 months, you can consider yourself in decent shape to make the Everest trek. Besides Cardio, you’ll also have to practice some strength training. As you’ll be carrying your trekking bag and the weight of clothes you wear will also add up during the trek, I would highly recommend strength training. But, remember you are preparing for a trek. So don’t overdo things. Keep it light. As with the cardio, start from your minimum and gradually inch upwards. You can start with 10 -12 reps and work your way upwards. You might have heard that exercising contributes 50 % to your health and 50 % is contributed by diet. And that is true. Many people don’t put diet in their preference when they start training. But you should not make that mistake. A proper diet that includes protein, vitamins, minerals, and carbohydrate should be maintained. Keeping your water intake high is necessary. When you run or hike, you’re losing water in the form of sweat. You should intake about 4 litres of water. But don’t over drink. A glass of water at one-hour’s interval is perfect. Drinking water regularly will come in handy as a low level of water consumption during trekking is one of the biggest causes of altitude sickness. And cut down on alcohol consumption. Alcohol tends to dehydrate your body and you should try to refrain from it when you are trekking. Even Sherpa people suffer from elevation sickness despite having spent all of their lives in high altitude. So, there is no way that anything will fully prepare you to keep the altitude sickness away. But elevation masks might do the trick. Elevation masks limit the amount of oxygen supplied to your body during exercise. So, if you exercise putting them on, you will definitely develop endurance. They are the closest thing that will help you prepare for the lack of oxygen in the mountains. There will be times during the trek where you might want to give up. After all, walking for 5-6 hours a day takes a lot of strength and courage. So, be mentally prepared before and during the trip. This is when having a group of friends will come in handy. They will keep pushing you and keep you energized during the trek as well. In cases of difficult situations, they will help you get out of physical stress as well by going according to your pace. You might feel that you could complete the trek with ease. But you never know when the altitude sickness will get better of you. You might also take a few days to feel the effects of exhaustion. Going slowly will enhance performance and help you adjust to the altitude. As you go slow, make sure that you have snacks along the way even when you might feel full. The cold burns a lot of calories. So, bars of chocolates will help you recover your energy. Also, you wouldn’t want to sweat by walking too fast. Sweating means that you’ll need to cool and that’s when the cold can really get you down. With slow steps take a few sips of water. Water and food are the two things that save you from altitude sickness. If at any point of time you feel that you won’t be able to continue, you should track down. If altitude sickness gets you, you should not try going any further. It can be fatal. So, going with a porter might come in handy. Porter will carry your weight. Remember, no matter how much you trek, you won’t be able to fully prepare for altitude sickness. Going with a porter will be a good alternative plan. There is nothing you can’t take care of with some healthy preparation. The same is true for trekking in Everest. There are four key things you should remember- developing mental and physical strength; proper diet and common sense. If you master these things, you will master your trek to Everest as well. So, take these proper measures and training programs before and during the trek. They will be your best bet to enjoy the Everest fully!